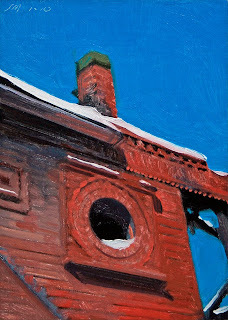 Oil on linen/panel, 2010, 7x5"
Today's daily painting is a view looking up at a snowy Brush Park building against a deep winter sky. 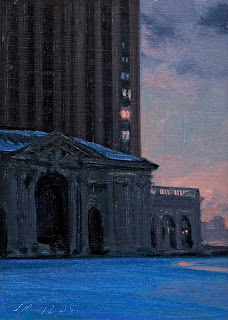 to a collector in Livonia, MIoil on linen/panel, 2010, 5x5"
Today's daily painting is a winter landscape of the New Center area of Detroit, showing the old GM Building and the Fisher Building. Have a great weekend! 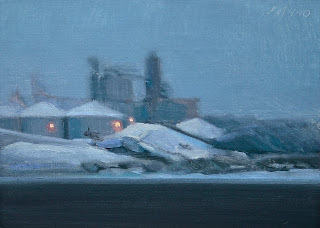 oil on linen/panel, 2010, 5x7"
Today's painting is a winter landscape of an industrial scene on the Rouge River. Now that I have gone through a few years with the blog is it interesting to return to some favorite areas as the seasons keep changing. I am glad I live in a state where we have four full seasons. 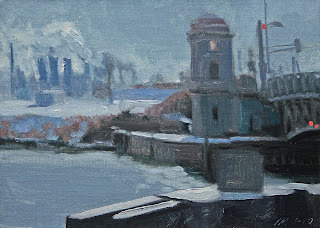 Today's painting is an industrial winter landscape on the Maumee River in Toledo, OH. 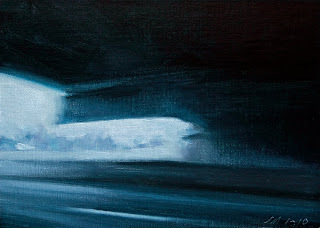 I would like to do a few painting based on the soft winter colors we are having now. 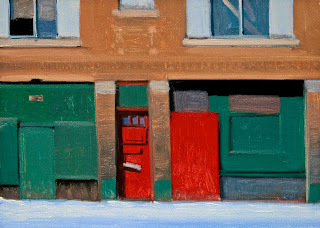 To see some beautiful winter cityscapes please visit: Peintures de Paris/Paintings of Paris by a french painter. 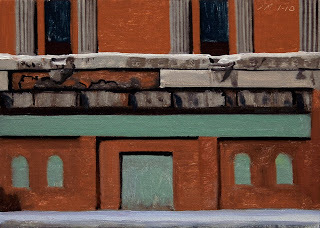 to a collector in Atlanta, GAoil on linen/panel, 2010, 7x5"
Today's painting is a view of an abandoned corner building in Delray, MI. 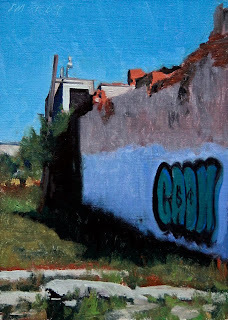 A painting of sunlight, shadows, graffiti, neglect and blue skies. 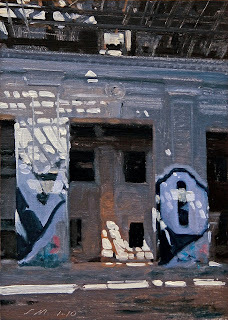 Today's painting is a view of the abandoned Michigan Central train station, showing a walkway under part of the station. to see a video of the inside this amazing building. 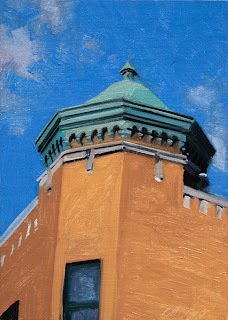 oil on linen/panel, 2010, 7" x 5"
Today's painting is an urban landscape of a Brush Park cupola against a deep cobalt blue sky. 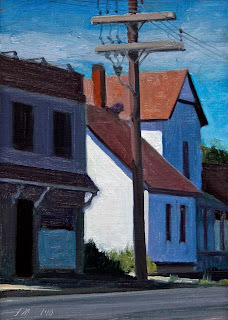 I really liked the abstract quality of this scene with it's deep shadows and sky color. 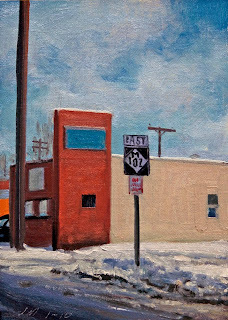 Today's painting is a view along the famous 8 Mile Road in Detroit. 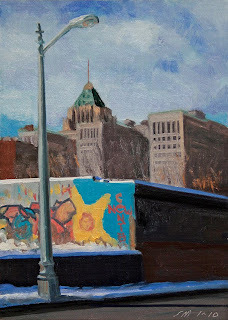 Today's painting is a view of the Fisher Building seen from Woodward Ave. This brightly painted wall against the deep shadows really created some interesting contrasts. 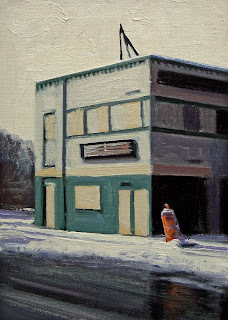 on oil on linen/panel, 2010, 7x5"
oil on linen/panel, 2010, 5" x 7"
Today's daily painting is the third in the series of abandoned building along East Jefferson Ave in Detroit. 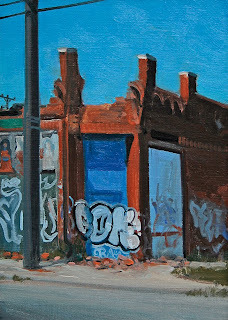 Today's daily painting is of another abandoned building along East Jefferson Ave in Detroit. 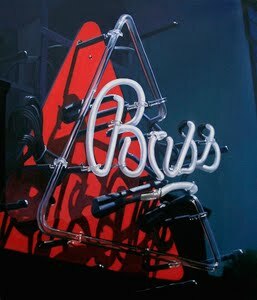 Please check out the Detroit Entrepreneurs article in the NY Times to see what young entrepreneurs are doing in Detroit. 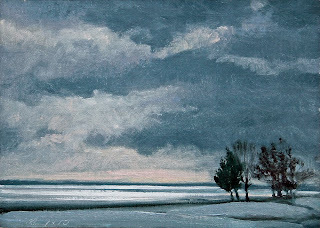 Oil on linen/panel, 2010, 5 x 7"
Today's daily painting is of an icy scene of Lake St Clair as seen from Lake Shore Drive. The sun was in and out of the clouds creating great color and contrast. 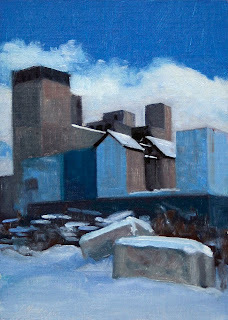 Today's daily painting is of an industrial landscape just off Jefferson Ave. This is another view of the buildings from Tuesday's post, with the sun finally shining giving the scene some needed warmth. 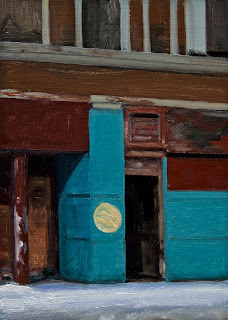 oil on linen/panel, 2010, 7 x 5"
Today's daily painting is of an abandoned building along East Jefferson Ave in Detroit. 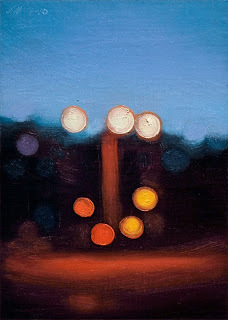 This one has been tagged with a Tyre Guyton Polka Dot. Please check out Tyre's Heidelberg Project. Also check out the Detroit Entrepreneurs article in the NY Times. 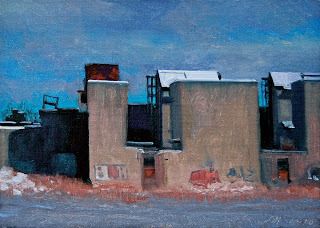 Today's daily painting is of an industrial landscape just off Jefferson Ave. I was very taken with all the wonderful shades of Blue. We waited and waited for the sun to hit these, but finally gave up. But I think I like the softness of the colors without the sun. 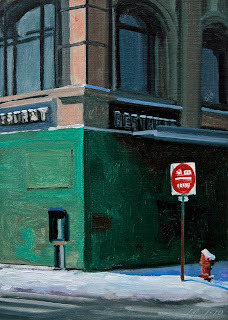 Today's daily painting is of the the corner building at Park and W Adams in downtown Detroit. A sign says now leasing, which is much better than just abandoned and forgotten. Maybe someone will open a restaurant. Check out the Detroit Entrepreneurs article in yesterday's NY Times. 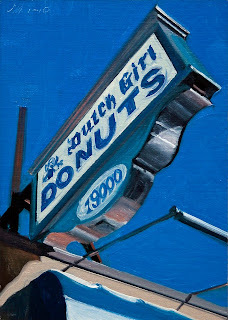 Today's painting is of the sign outside the wonderful Dutch Girl Donuts store. Please take my word, forget Krispy Creme and anyone else. The people at Dutch Girls know how to make donuts. One of our favorite stops in Detroit, we stopped yesterday and I had the last one for breakfast today with coffee. Very friendly and the price is right. The link will take you to a recent article on them. Yummy, yummy! Enjoy! 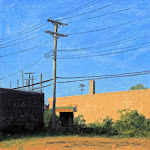 Today's painting is an Eastside Detroit urban landscape. I enjoyed the warm red wall with the green and dark cool wall behind it. 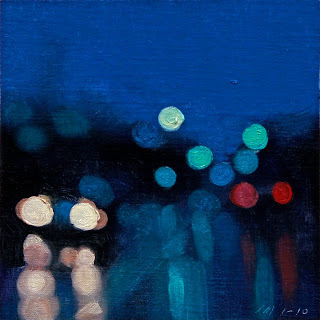 Today's daily painting is number fifty-one in the Detroit Citylight series..
oil on linen/panel, 2010, 5x5"
Today's painting is number fifty in the Detroit Citylight series of paintings. 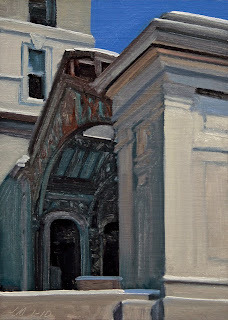 Today's painting is a scene of a white house and shadows along Michigan Ave in Detroit. 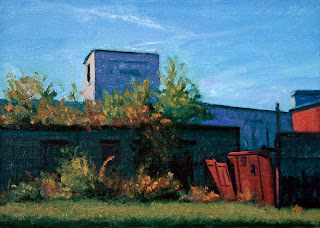 Today's painting is another of Brush Park. 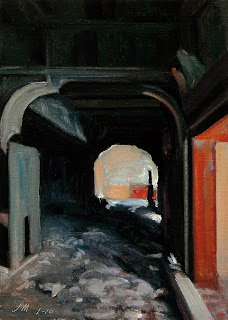 I really liked the contrast of color and the abstractness of the shapes in this scene. The graffiti with the dollar and cent signs is also interesting, making a little statement. 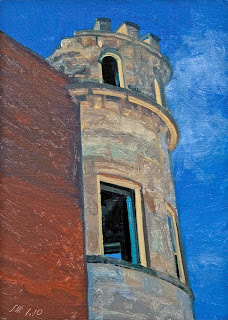 Today's painting is a view looking up at a turret of an abandoned Brush Park building against a deep cobalt January sky. 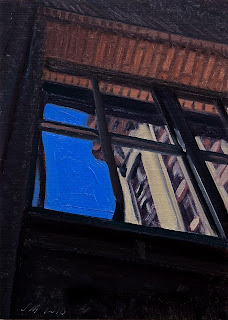 oil on linen/panel, 2009, 7x5"
Today's painting is a view looking up from Woodward Ave. in Highland Park. 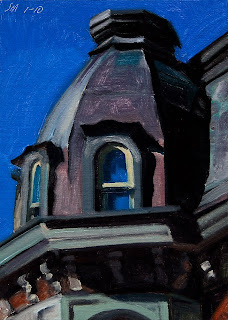 I like the way the warm bricks and copper roof work against the deep cobalt January sky. This is one of my wife's favorite buildings along Woodward Ave. The whole building was vacated this winter, I think it was with the landlord not paying the utilities and they were shut off. Such a shame. 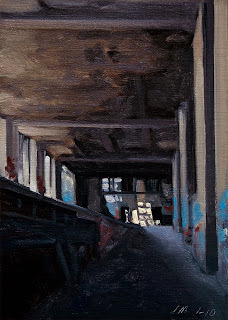 Today's painting is a view inside the abandoned Michigan Central train station. I was really moved by the play of light on the tagged columns. It was serene and exciting at the same time. I feel this is one of the more successful daily paintings I have done, I hope you like it. to see inside this amazing building. Mi Central Nocturne HAPPY NEW YEAR! 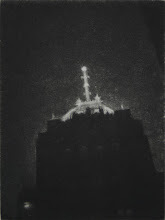 Today's painting is a nocturne of the abandoned Michigan Central train station.